With this new advanced lens adapter, you can use Tamron Adaptall 2 lenses on Sony E mount camera body, such as Sony NEX-3 NEX-3C NEX-3N NEX-5 NEX-5C NEX-5N NEX-5R NEX5T NEX6 NEX7 NEX-F3 a6000 a5000 a3500 a3000 Alpha A7 A7R NEX-VG10 VG20 etc. 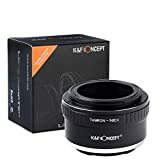 • The K&F Concept Tamron Lens to NEX Lens Camera Mount Adapter allows you to place your favorite Tamron lens on your NEX camera body. This entry was posted in Discount Photography and tagged Adaptall, Adapter, Body, Camera, Concept, lens, Mount, Tamron by Ball Photo. Bookmark the permalink.